Polylab micro test plates are made of optically clear, non-toxic polystyrene. These plates with 96 u bottom or flat bottom wells bear alpha-numeric index. Uniform placement of all the wells facilitate use of multi channel pipettes. 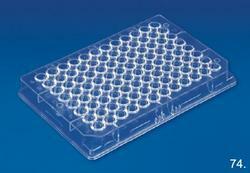 These micro test plates are made of optically clear, non-toxic polystyrene. These plates with 96 U Bottom or flat bottom wells bear alpha-numeric index. Uniform placement of all the wells facilitate use of multi channel pipettes. Our organization is offering Test Plates to our clients. Because of these uniform placement of all the wells, these Test Plates facilitate use of multi channel pipettes. Our clients can avail theses lenses in various specifications. Made from clear non-toxic polystyrene, these plates features uniform placement of all the wells facilitate use of multi channel pipettes. This plate has option of 96 wells of either U-Bottom or Flat-bottom wells with alpha-numeric index. 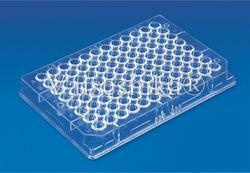 Micro Test Plates are made of optically clear, non-toxic polystyrene. These plates with 96 U Bottom or flat bottom wells bear alpha-numeric index. Uniform placement of all the wells facilitate use of multichannel pipettes. 96-well micro plate can be packed with less sorbent, which allows to load a small amount of sample and elution solvent. The 96-well microplates with a special detachable design; loose cartridges use an internally tapered well design and make sure enough sorbent bed.